Shopify is a top-rated eCommerce platform that gives its users the power to easily sell anything from anywhere. With Shopify, business owners can fully customize their online store, manage unlimited inventory, take orders online or in person, track sales trends with analytics tools, source products exclusively from Shopify’s dropshipping suppliers, and so much more. Shopify pricing includes 4 primary selling plans, adds processing fees if you use Shopify Payments to process credit cards, or transaction fees if using your own processor. We recommend Shopify as the best eCommerce platform for small businesses due, in part, to its economical and easy-to-use system. It has different plans, varying in price and features, to meet the needs of any eCommerce business. We’ll explain what features each pricing plan includes, but you can actually try Shopify free for 14 days before choosing a plan. Click here to start your free trial — no credit card required. Annual Plan Prepayment Discounts – Shopify offers discounts on their monthly fees if you pay in advance. Save 10% on your Shopify prices if you prepay 1 year; save 20% if you prepay 2 years. Shopify Payments – Shopify Payments is Shopify’s credit card processing service. If you use your own payment processor, an additional transaction fee is added to standard Shopify pricing, ranging from .5% to 2% on every sale, depending on your plan. Free 14-Day Trial, No Credit Card Needed – Testing out Shopify is completely risk-free. You can set up a test website, add products, and even process sales. If you like it, you simply pick your plan, provide your credit card information, and continue building your Shopify business. Try Shopify today. Shopify pricing plans meet the needs of all types of sellers and a wide range of budgets. Sellers who don’t need a Shopify website can sell securely on blogs and Facebook for just $9/month, while businesses needing a website can launch one on any budget. The Basic Shopify pricing plan delivers what most small online sellers need for just $29/month. Shopify and Advanced Shopify support growing and volume sellers by adding a range of advanced reporting, marketing, and shipping functionality for $79 or $299 per month. Plus, in-store retail selling can be added to any plan for just $49/month. If you’re new to Shopify or online selling in general, here’s a look at the types of sellers that use Shopify’s 4 plans. Shopify Lite is ideal for sellers who want to add products to their existing blog or standard website and sell on Facebook or in-person using a mobile device. You can also send invoices and accept online invoice payments. Shopify prices this plan to be very startup-friendly. 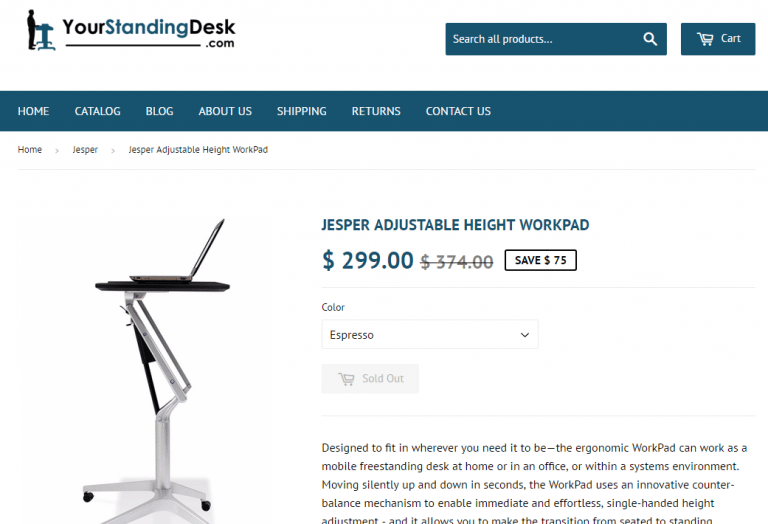 Best for: Sellers who don’t need a standalone ecommerce website. Basic Shopify delivers everything the new or small business seller needs to sell online, market their website, create a blog, and sell on other channels like Amazon, Facebook, Pinterest, and in-person sales. Shopify prices this plan to be in-line with the needs of small-volume online sellers. Best for: Sellers who need a standalone ecommerce website and multichannel sales capabilities. The Shopify plan gives you all of the features of Basic Shopify plus advanced capabilities like cart recovery, gift cards to optimize sales, and expanded reporting capabilities. With this plan, sellers using Shopify Payments to process credit cards also pay a lower processing rate. So if you sell more than $25k/month, the Shopify plan is worth the higher monthly fee. Advanced Shopify is geared for high-volume sellers who use all the capabilities of the full Shopify plan, but need added features such as real-time shipping rates and customizable reporting. Advanced Shopify sellers also get the lowest Shopify Payments processing rates of all 4 plans. If you sell more than $110k/month, the Advanced plan is worth the higher monthly fee. But That’s Not All. If you outgrow the Advanced Shopify plan, Shopify prices their Enterprise plans to meet specific needs. On this plan, you can custom-tailor ecommerce features and save even more on credit card processing. Shopify prices this level of service to meet specific platform and budget needs, so on Enterprise plans, Shopify pricing isn’t standard. But, it’s nice to know that if you’re busy enough to outgrow Advanced Shopify, you can stay on the same platform and get a solution that fits your business. Shopify clearly provides great selling features with each plan and supports a full range of online, in-person, and multichannel sales for startup businesses to power sellers. Here’s a plan-by-plan comparison of key features to help you decide which Shopify pricing and plan best fits your unique needs. Shopify is a versatile multichannel ecommerce platform that all types of businesses can use to tie their online, in-store, and mobile sales into one streamlined solution. Whether you sell handmade goods part-time, are a high-volume ecommerce multichannel seller, or a bustling retail store moving into online sales, with Shopify, you can sell wherever and however you like. It even has its own dropshipping supplier channel, Oberlo. With Oberlo, you can find items to sell on Shopify without ever having to worry about shipping, packaging, or housing inventory. Click here to start a free trial. If you already have a website or blog, or an active email newsletter, Shopify’s Buy Button lets you turn these into selling tools, all without launching a completely new website. You simply list products for sale in your Shopify inventory and Shopify provides you with a button code for each product. You add this code to your web page, blog post, or email campaign, and when a shopper clicks the button, it opens a secure Shopify shopping cart. Shoppers can even add multiple items and checkout all at once. Every Shopify plan level lets you sell products on Facebook page using Shopify’s native Facebook Shop and Facebook Messenger integration. This is a seamless connection with Facebook, no app needed and no additional costs. By selling on Facebook using Shopify, Facebook users can view and securely buy your products without ever leaving Facebook. 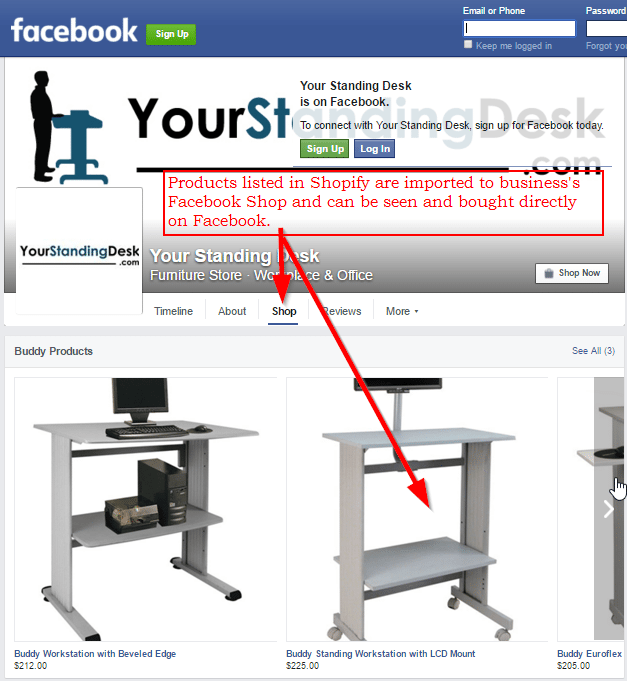 Plus, you have total control of the products you list on your Facebook Shop and you can easily use your Shop listings for Facebook promotions and ads. Shopify also supports a native integration for Pinterest Buyable Pins on the Basic Shopify and higher plans. The $9/month. Shopify Lite plan doesn’t support the Pinterest Buyable Pins. With the Pinterest Buy Button feature, you can create “shoppable” Pinterest pins that include a Buy button, shown above. When a Pinterest user clicks the Buy button, the item is added to a Shopify cart for secure checkout. Pinterest selling is fast-growing and an ideal channel for selling handmade goods, home decor, collectibles, and all types of arts and crafts supplies. Shopify online stores are considered the simplest ecommerce stores to set up and run. So, if you don’t have an existing blog or website for buy-button selling, you can build your own Shopify store website quickly and easily. Shopify delivers every online selling feature you need: manual or file upload for products, 100s of mobile-friendly designs, inventory tracking, secure checkout, tax collection, shipping calculations and label printing, and the list goes on. See how easy it is to build your own Shopify store with our step-by-step Shopify store builder guide. Shopify’s free credit card reader lets you sell products in-person from your mobile phone or tablet. This is a great feature for businesses that take their sales on the road to fairs and shows. With the mobile card reader, can take payments, add cart or line item discounts, add custom taxes, mark sales as completed, and even take payments for items or special orders to be shipped at a later date. Shopify is known for being a top ecommerce solution, but they’ve expanded to become a top retail in-store point-of-sale (PO) solution, too. For an added $49/month you can add Shopify’s powerful cloud-based Retail Package POS software to any selling plan. With it, you can fully integrate any in-store selling with you online, social, Amazon, and mobile sales. This ties your inventory, orders and sales, staff management, and business reporting into one tidy, easy-to-manage package. Shopify prices and plans cover a full range of small business budgetary and selling needs. However, every business is different. Some need specific online selling features, such as dropship supplier or print-on-demand vendor integrations. Others might need to access more seller marketplaces such as Etsy, Ebay or Walmart. Still others need to expand their marketing, order fulfillment, or countless other operating capabilities. This is where Shopify Apps can help. Shopify’s App Store offers apps from both Shopify and third-party developers to extend the capabilities of your website in countless ways. Prices vary, some apps are free, some charge a flat monthly fee, and others take a percentage of each sale. For example, you can enable customer reviews using Shopify’s Free Customer Review App, which we walk you through in our step-by-step guide. There are many hundreds of Shopify apps, but it’s easy to find just what you need using Shopify’s filter, shown above. 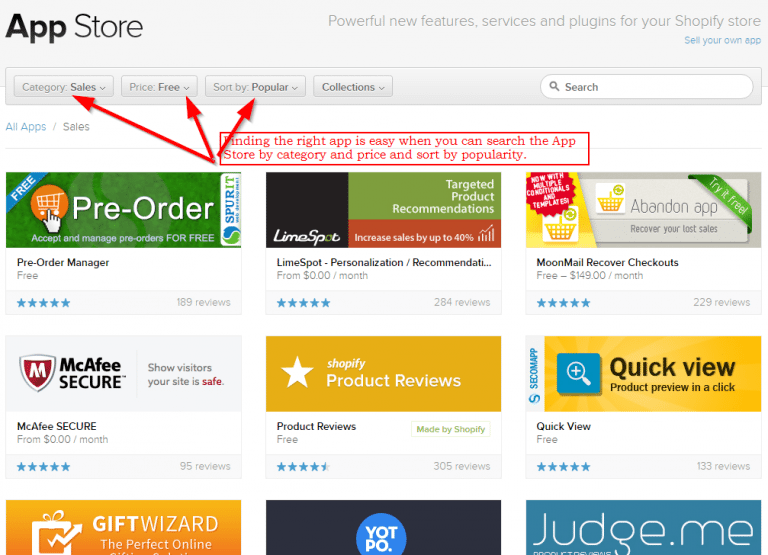 You can select from 11 app categories, then filter further by price and popularity. For a look at the free Shopify apps used by top sellers, check out our Best Free Shopify Apps guide. Shopify prices its ecommerce plans to meet virtually any small business’s budget and selling needs. Shopify pricing starts at just $9/month. At this level, bloggers can add Buy Buttons to their blog pages and even push products onto a Facebook Shop. Shopify prices its full-featured ecommerce plans starting at just $29/month. Power sellers can pick from advanced plans with set Shopify pricing of $79 and $299/month, or custom-tailor a plan to fit their exact ecommerce needs. And any one of these sellers can add mobile or in-store selling to expand their reach. Do you sell using Shopify? If so, we’d love to hear how you use the platform and what you think of Shopify pricing. Are you solely ecommerce or a multichannel seller? Do you use Shopify’s POS system for in-person or retail store sales? Please share your thought and insights in the comments below. You state, “6. Retail Package Point-of-Sale (POS) System: $49 Add-On to All Plans.” Is that a one-time payment or an additional $49/month to the basic $29/month plan? Thank you for a terrific article. It’s a $49 monthly fee to add Shopify’s full retail package POS features (including staff management tools and hardware integration to your Shopify account) to your regular monthly Shopify ecommerce plan. Plus, there are hardware costs for a register setup. 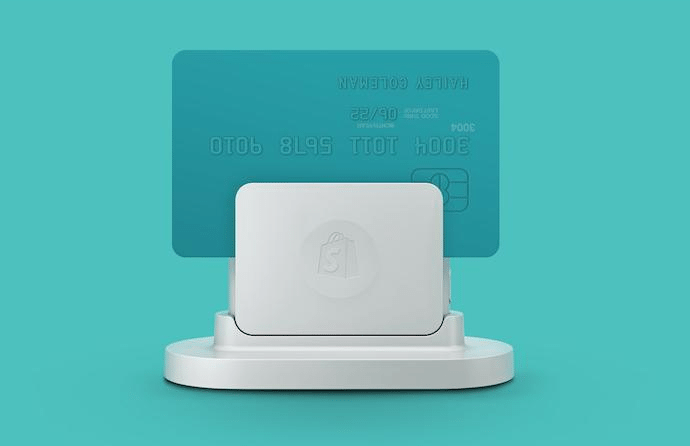 If you just want to be able to accept mobile payments using Shopify Payments and don’t need the complete retail setup, they provide you with a free card reader and connectivity at any level Shopify account. It’s a pretty slick solution if you’re primarily an ecommerce seller wanting to also sell in-store and accept mobile payments. If you primarily sell in-store and via mobile with little to no ecommerce, Square is the less-expensive solution in most cases since there’s no monthly fee. Plus you get a free POS with more built-in tools, like staff tracking and multi-location sales. Very informative! What if I’m already using the shopify basic plan. Is there a ways to downgrade it to Shopify Lite? You should be able to downgrade at any time. But, you may have to get in touch with customer support to have them switch your plan. It can be done, for sure. I went from about $500 sales in my first month to over $1.5 million in sales per year in about 3 years. So I far more than doubled my money, but it takes hard work to build every aspect of a profitable operation. But yes, you can certainly do that on Shopify. If you’re looking for how to get started right, checkout out our collection of ecommerce startup articles. Good luck! Shopify appears to provide an easy platform to start an ecommerce business, if that was the only factor to success then stores opened on shopify would have 100% success. Shopify is a powerful and intuitive eCommerce tool that’s perfect for many small businesses. But even with all the right tools, running a successful small business is tough work. We do our best to equip our readers with the best information so they every possible advantage. From starting a business, to increasing sales, to financing your first big expansion – we want our readers to have a leg up on their competition. Great guide, thanks for posting it! Shopify changed my way of thinking about leading my own online store. It’s really easy-to-use, intuitive and reliable online selling system. Last month I found a nice reporting app which improved my sales management results – SimplyTick. It met my expectations perfectly. Hope you will check it. We couldn’t agree more: Shopify is certainly intuitive and reliable. And the customization that Shopify’s App Store allows for greatly expands small businesses’ capabilities. I am glad you found an app that works for you.